Most non-scientists know that white objects reflect, and black objects absorb, solar radiation. Some people may even know that blacker bodies are better at emitting radiation. This leads to the interesting question - If you want to keep an object cool, should it be white, to reflect heat, or black, to emit it more efficiently? It's questions like this that keep physicists employed. In a previous article (Coffee Thermodynamics, June 17, 2011), I discussed the cooling properties of white vs black substances in the context of cooling coffee. For those who put milk in their coffee, if they want their coffee to reach a drinkable temperature faster, should they add milk immediately, or should they wait a particular interval? Cooling of such a liquid involves much physics. First, is milk white in the infrared, where it really counts? At coffee temperatures of about 100°C, heat loss by radiation is overshadowed by conduction. In that case, liquids with a higher differential temperature with respect to their environment will cool faster; so, it would seem, delaying the addition of milk is better. Other processes, such as convection and evaporation would be important. We've essentially come to the point at which some experiments would be much more effective than equations and computer models. Many experiments have shown that keeping the coffee black longer does lead to a cooler final liquid. [1-3] One series of experiments showed that, for a particular set of initial conditions, waiting 310 seconds to add the milk brought the liquid to a safe drinking temperature 85 seconds faster. The roof of my house is white, and I didn't select that color just to contrast with the barn red color of the house itself. I chose it because New Jersey can get quite warm on summer days, and the white reflects the solar radiation. The downside, of course, is that it would be nice to capture that insolation in the winter; but natural gas for heating is much less expensive than electricity for cooling. (1) An ethylene–propylene–diene (EPDM) rubber membrane. (2) A thermoplastic polyolefin (TPO) membrane. (3) An asphaltic multi-ply built-up membrane coated with white elastomeric acrylic paint. Not surprisingly, the membrane solutions were highly effective, maintaining an albedo of greater than 0.5 even three years after installation. This performance meets the Energy Star Cool Roofing performance standard. What's especially interesting is that the EPDM membrane did not show any winter heat penalty. The painted surface showed an initial high emissivity, but it lost about half of this after the first two years of environmental exposure. This paint approach, however, is a convenient and inexpensive mitigation approach, so further work is needed on improving these paints. The white membrane coverings, which are professionally installed, cost about $15 to $28 per square foot. The white paint costs about 50 cents per square foot. 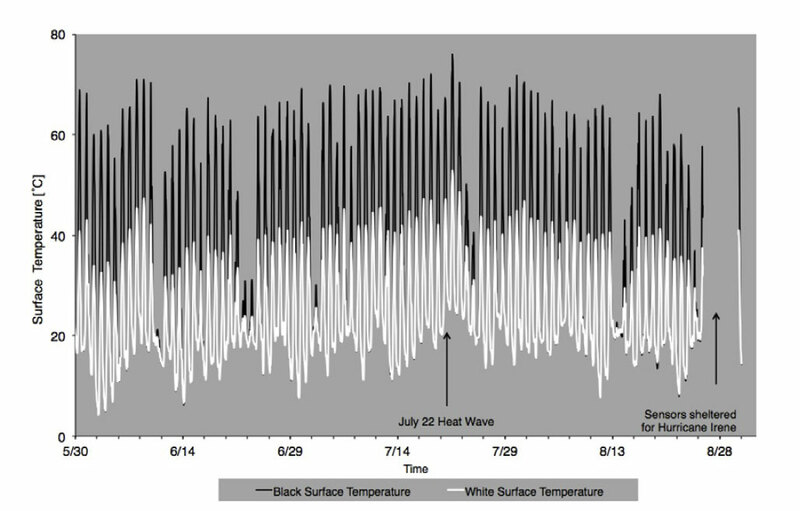 As shown by the data (see figure), July 22, 2011, was an exceptional day for NYC temperature in which some rooftops rose in temperature to 170 °F. Test data of side-by-side roof patches on the Museum of Modern Art showed that a white painted roof surface was 42 °F (23 °C) cooler than an unpainted black roof. Through its NYC CoolRoofs program, New York City is attempting is attempting a mitigation of the urban heat island" effect. This effect, caused by the general blackness of a city compared to its rural surroundings, increases summer nighttime temperatures in New York City by as much as 5 - 7 °F, and it will be a problem if global warming continues. Said Stuart Gaffin, lead scientist on this study and a professor at Columbia University, "Bright is the new black." A paper summarizing these findings is published in Environmental Research Letters. Unanswered is one question that I've always had. Why do we say hoof and hooves, and roof and roofs? Mary Ellen Verona, "The Coffee Cooling Problem," Maryland Virtual High School of Science and Mathematics Web Site. S. M. Blinder, "The Coffee Cooling Problem," Wolfram Demonstrations. W. G. Rees and C. Viney, "On Cooling Tea and Coffee," American Journal of Physics, vol. 56, no. 5 (1988), pp. 434-437. Steve Smith, "Brew-haha? Coffee Cools More Quickly If You Wait to Add the Cream," National Engineers Week Foundation Press Release (No Date). This article references the presentation, "The Mechanisms of Cooling Hot Quiescent Liquids," made by Darwin Novak and Robert Seidel at a meeting of the American Institute of Chemical Engineers. S R Gaffin, M Imhoff, C Rosenzweig, R Khanbilvardi, A Pasqualini, A Y Y Kong, D Grillo, A Freed, D Hillel and E Hartung, "Bright is the new black - multi-year performance of high-albedo roofs in an urban climate," Environmental Research Letters, vol. 7 no. 1 (January-March 2012), Socument No. 014029. Patrick Lynch, "Bright Is The New Black: New York Roofs Go Cool," NASA Goddard Space Flight Center Press Release, Narch 7, 2012. Linked Keywords: Scientist; white; black; sunlight; solar radiation; black body; emissivity; radiation; physicist; coffee; milk; temperature; liquid; physics; infrared; Celsius; Stefan-Boltzmann law; conduction; room temperature; convection; evaporation; experiment; equation; computer model; Dominique Toussaint; Wikimedia Commons; roof; barn red color; New Jersey; summer; insolation; natural gas; electricity; NASA; New York City; urban heat island effect; albedo; ethylene–propylene–diene rubber; EPDM; thermoplastic; polyolefin; asphalt; elastomer; acrylic paint; Energy Star Cool Roofing; square foot; Fahrenheit; Museum of Modern Art; Stuart Gaffin; NYC CoolRoofs program; global warming; Columbia University; Environmental Research Letters; hoof.